I thought that if I was going to whip up a salted caramel concoction it may as well be a hops salted caramel sauce. So here is the latest Perrine craft beering contribution to all hop heads and salted caramel lovers alike. And all fans of good tasting delicacies. Since we were low on hops salt I made a fresh batch, this time with Mosaic hop pellets. 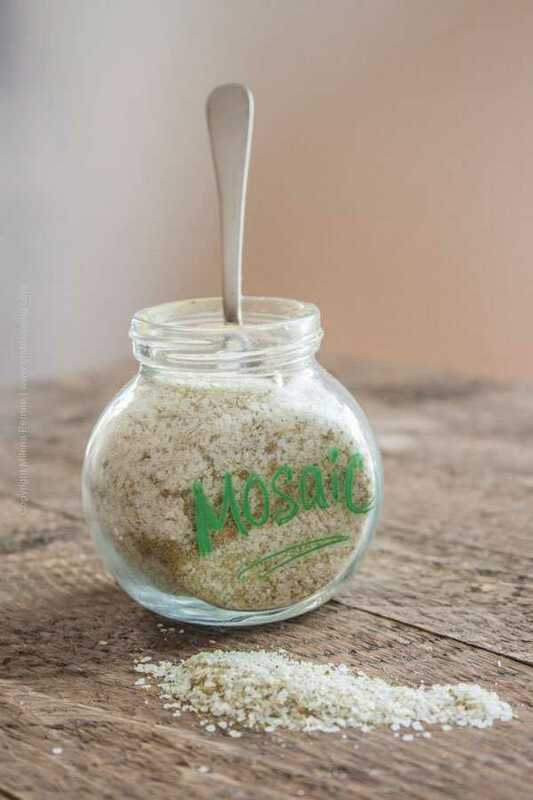 As a refresher, Mosaics are one of the newest hop strains first ‘released’ in 2012. Even though their alpha acid content is pretty high, ranging from 10.5% to 14%, they are also used as an aroma hop, frequently in dry-hopping too, and contribute a variety of pleasing notes ranging from tangerine, blueberry and papaya to pine, herbal and even bubble gum. Needless to say they are enjoying increasing popularity and their production has been growing exponentially since 2012. 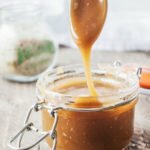 We had some pellets left from Chris’ last home brew and I found smelled them to be a great choice for this hops salted caramel sauce. Homemade salted caramel is a breeze to create and that fact emboldened me to document the recipe steps in video format. Before I wrap up this post – take a guess, just for fun. 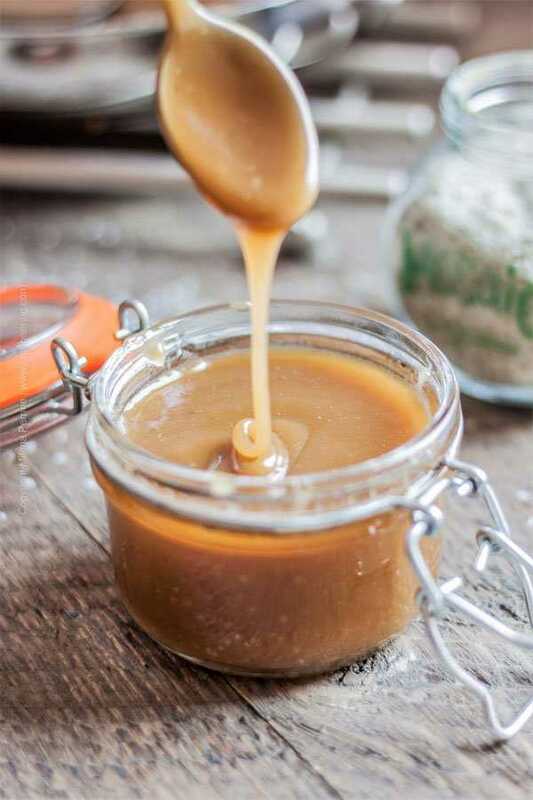 Who do you think liked the hops salted caramel sauce the most in our tiny family? A moment of parental joy – maybe he will like craft beer one day after all… For now, he frowns at soda, which is great news really. Carbonation and our little one do not agree with each other. Period. He thinks Chris and I are confused about the good things in life. Because we like beer. He cannot imagine how a carbonated drink can be pleasing to anyone. Even if it is sweet. Plenty of time though, he might one day join our beer tasting table. For now I am actually happy that he has zero interest in soda. Showcasing the enigmatic flavors of hops in a hops salted caramel sauce. Hop heads and salted caramel fans rejoice! You can whip this one up in less than 10 minutes. Drizzle over ice cream, fruit, cake, baked goods. Use as a dip for fruit or even cheese. Use your imagination. Pair with IPA, pale ale, stout. In a sauce pan over medium heat combine the butter, brown sugar and cream. Stir until smooth and bring to simmer. Let simmer for 4 mins. Turn off heat and sprinkle with the hops salt. Stir and remove from stove, let cool off and thicken for a few minutes. When it is comfortable to the touch, taste it and add more hops salt if desired. Seriously, your blog is just simply delicious. Thank you for sharing your love with us. Thank you Carol, so happy to hear! Thanks you for the share! Oh man, this looks amazing. Yum, yum, yum! 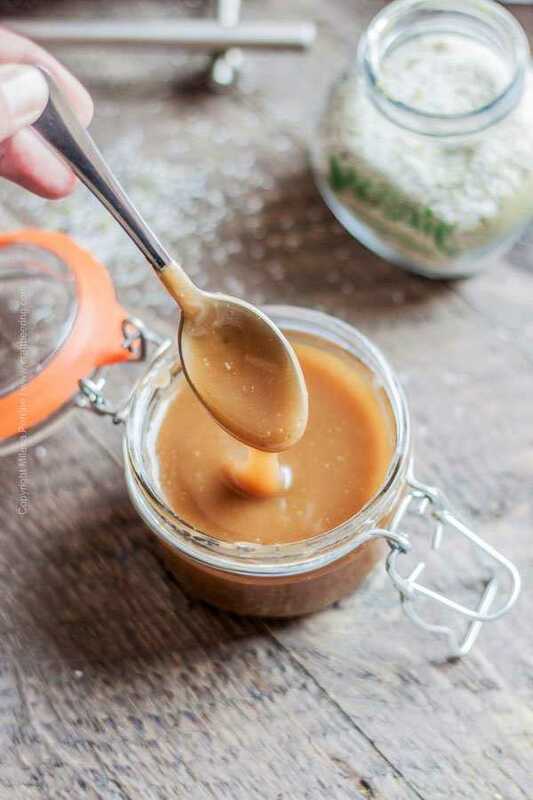 Your Caramel Sauce will be awesome on our homemade Ice Cream! Thanks so much for sharing your post with us at Full Plate Thursday and have a great weekend! In full agreement Miz Helen! Thank you! As always your posts take flavour to a whole other level. Amazing. Pinning as this is so out of the ordinary every day. Oh, I bet this has a fantastic and unique flavor! Thanks so much for sharing at the #happynowlinkup! I think that seven year old has great taste! I always say start them early! This sounds awesome! Thank you Abbe:) He does seem to have an affinity for good things. Thank you Jodie and thank you for the invite! Do give it another shot Mary! 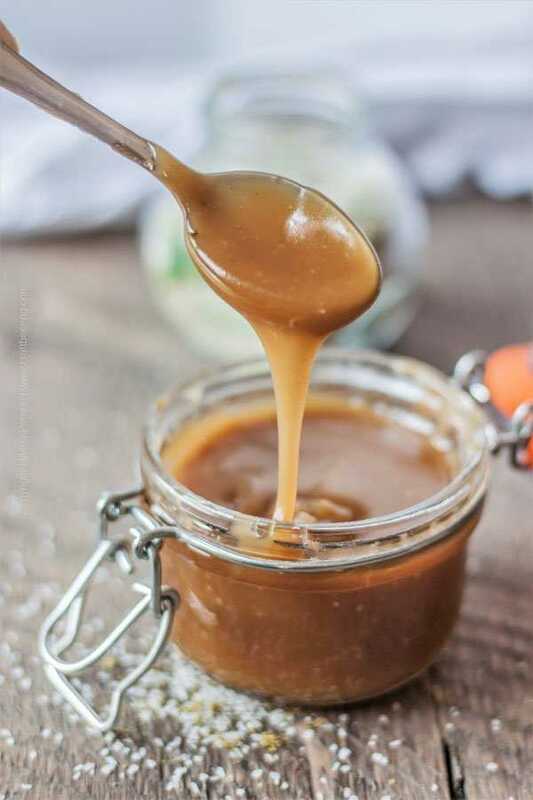 From making peanut brittle I know that if you go past the hard candy boiling temp you burn the caramel…This sauce doesn’t cook long enough to burn:) You will shine. This might be more than you want to know about me, but I’m drooling all over my computer. This sounds AMAZING! Eat it out of the jar with a spoon amazing. Your video was great too! I had to watch several times for research purposes (and because, ummmm, salted caramel). I’m still too intimidated to try doing one. . . Have a great week, Milena! Lol! My son pretty much finished the jar spoon in hand as soon as I used what I needed for drizzling over the next recipe we’ll be posting:). I am sure you will make some great videos:) Thank you for the encouragement Kelsie! Love sweet and salty so this is hitting all the right notes! And I loved your video! Wish I had a crock tucked in the fridge right now! Pinned! Love sweet and salty combos. LOVE!! And let’s talk about that video! High five! What an AWESOME job! It was mesmerizing to watch 🙂 So good! Can’t wait to see what you use it on. Though, I could pretty much eat that straight up, lol. P.S. So awesome that your son doesn’t care for soda! My niece is like that too; she would much rather water any day. Have an awesome week, you guys! You are too kind Dawn:) Thank you for the support! Sounds great about your niece – pretty much an identical situation.